It’s all in the look, New Bingo look that is. Live Bingo Network adds another winner to the camp of solid brands. The site established in 2013 is another reason why online bingo is the UK’s preferred choice. Take a glimpse, peek, glance or long lingering gaze and New Look Bingo takes the UK on a Bingo craze journey. It was summer August 2013 to be precise when the virtual doors opened to new choices for the Bingo community. The name implies a “New Look” but yet the landing page doesn’t have anything out of the norm. What does stand out from the crowd is the platform powered by Cozy Games software. Bingo advocates are all too familiar with this supplier of products including too many brands to mention that it powers. If you are a new player to this online Bingo giant you’re in for an impressive treat. New Look Bingo is locked down utilizing C.O.M.O.D.O authentic and secure services. Games are thoroughly tested an outside company ensuring optimal performance for random outcomes and honest gaming. What determines an excellent source of gaming is bingo variety and New Look Bingo has it. There aren’t one but four variations including UK 90 ball, US 75 ball, 80 ball and 30 ball for speed bingo. Ticket prices begin at one penny with Progressive Jackpots up for grabs. Gather your friends, pick a name and be a part of the fun competition in Team Bingo awarding prizes to the top team. There are two Free 90 ball bingo rooms awarding players with cash prizes. Chat moderators entertain roomies with Chat Games offering prizes to the lucky winners. Other games in the lobby include Slots, Casino Games and Scratch Cards. Play games with Cash or Bingo Bucks. You know what you’re looking for straightaway and we won’t leave you in any more suspense. Yes, there is a Free No Deposit required. Make you way through the bingo rooms and experience the fun at no expense to your pocketbook. There are Reload Bonuses on all deposits funding your account with oodles more credits. The marketing team has done a tremendous in offering a slew of promotional offers that include Daily Specials. Slot Promos include lucrative specials including Cash-back on losses. Happy Hour boosts your deposits during selected times. There is always Bingo Bucks up for grabs in a variety of offers. 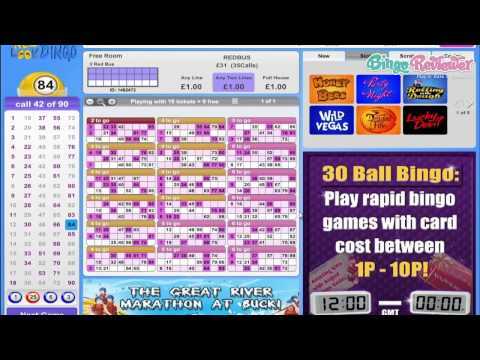 Ways to earn BBs include writing a blog to get 15 Bingo Bucks Free through the Live Bingo Network, Chat Games and Bonuses. There is a magnificent promotional variety of goodies. Happy Hour Bonuses can only be claimed from your 4th deposit on. The Break Time Quizzer has tons of cash ready to scoop up when the Quiz Master pops up in the Bingo rooms. Free Bingo is available 24/7 to depositing players only including a free room for non-funded players. We rate New Look Bingo with 4 Pink Hearts. I wasn’t too crazy about the layout here. It’s colorful but kind of boring. It could use more of an overall theme. For a site called new look bingo, I expected them to have a much nicer layout. They do start you off with a decent welcome bonus though. Just for signing up, they will start you off £15 free. There is no deposit required for this bonus! I was able to play for a little while before I had to make a deposit of my own. It gave me a chance to try out their games before I actually had to pay for them. They have a huge variety of bingo variations available. Their selection includes 30, 75, 80 and 90 ball. The jackpots are very nice. I also enjoy the slots they have to offer here. One of my favorites to play is Treasures of Egypt! They also have a mobile version of the site. I actually like this site's layout, and I find it looking good on a larger screen. The navigation is real easy and fast, and you won't find yourself wondering where to look for important information. What I specially like is their mobile site version that looks great on smaller screens. Although not all the games are available through mobile site version, it's just enough for those who can't wait to get to their computers. There are 13 Bingo rooms available in total, and that's impresive, with all the bingo you can take (the regular 75 and 90 ball games, but also 80 and 30 ball games). You can easily see that it is a UK site just by looking at the room names. You start off with a £15 no deposit bonus, and you can even get more with logging to their mobile site or liking them on Facebook, but you do need to make a deposit before making the first withdrawal.